Sure, there’s a ton of things to consider when buying a home. But, when you have kids or are planning to have them in the future, there’s some additional factors that enter into the equation. Finding a kid-friendly home where your children can live, thrive, and socialize is just as important for them as it is for you. Trying to buy a home with kids in mind definitely does add another element. But, it isn’t difficult. And, we’re also here to help you out. We complied a few key factors to consider when buying a home with kids. Our guide below will help you navigate through the process for a stress-free home buying experience. And, find you the perfect home that the entire family will feel comfortable in. Though, predicting the future with a crystal ball is a bit risky, you may want to consider buying a home larger than what you currently need. You may only need a three bedroom home now, but what think about the future. Are you planning on having your kids share a bedroom or, will each have their own? It’s always a good idea to have a spare bedroom. You never know when you may need it. But, until you do a spare bedroom can do double-duty as a storage room, a kid’s playroom, a craft room, or even a music room. And, what about the size of other rooms in the home? Does your family gather in the kitchen or family room on a daily basis? Will you need a dining room for holiday gatherings? Your answers to these questions will help determine the size of home to purchase. There’s literally hundreds of floor plans with a multitude of options. When choosing a floor plan it is best to consider your family’s lifestyle and whether it’s kid-friendly. 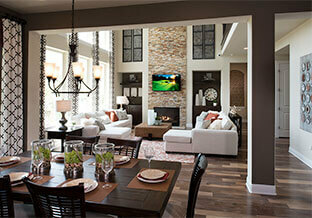 Two trendy floor plan options in today’s market include media/game rooms and first-floor master bedroom suites. Media rooms are great options for families with older children. But, if you small children do you want a first-floor master when all the other rooms are on the second level? Do you want a one or two-story home? One-story homes with no stairs are ideal for families with small children. Open concept floor plans are still trending. But, is it right for you? They are great for entertaining and bringing the family together. However, they can also lack privacy and make it difficult to keep areas free from messes. Read more about the pros and cons here. Living in a school district that meets the educational needs of your children should be a key factor in where you buy your home. Therefore, it’s important to do your research. Will they attend private or public schools? If you’re not sure, it’s best to research all options. Buying a home in a high-ranking school district is advisable. Not only are you assured they will receive a quality education, it’s also a great resale tool. People tend to want to live in areas with top-notch school districts. We have written a lot about finding the perfect location for a new home. And, frankly, it still is one of the most important factors to consider. Not only for you, but for your children. A short commute to work is ideal. But, so is a short walk or bus ride to school Do check the distance of the school your children will attend from your home. Another factor to consider is the type of street. When touring homes it’s extremely important to consider the street’s traffic flow. Does it appear busy during peak commuting hours? Or, is it relatively quiet most of the day? A street in a neighborhood, or one on a cul-de-sac is much safer and kid-friendly than one near a main roadway. As a parent you’ll want to ensure your kids will be safe both inside and outside your home. Two-story homes have stairs. That’s the only way to get from the first level to the second. And, small children seem to naturally want to climb up them. Which makes it a bit of a challenge for parents. Make sure the home you buy will accommodate stair gates. But, also look at the other fixtures inside the home such as cabinet corners, carpeting vs. wood flooring, and where the rooms are located in the home. As far as the home’s exterior environment take a walk around the neighborhood. Are streets and pedestrian cross-walks properly marked? Are designated play areas off a main roadway? Also, does the home have a fenced-in yard? It’s a great way to contain both kids and pets. Playgrounds, parks, recreational amenities, bike trails, and walking paths are great ways to keep kids busy and outside. They also help families spend quality time together and keep everyone fit and happy as well. Check to see if the community you are interested in has an amenity center. Or, if there is one in close proximity. A perk of buying a home in a master-planned community is the type of amenities they offer. On-site swimming pools, fitness centers, recreational fields, trails systems, organized events, and kid-friendly activities are just a few amenities that are offered in these types of communities. And, think about it. With all these amenities there’s sure to be kids. Which makes a master-planned community the perfect environment for your kids to meet, socialize, and go to school with others their own age. Are you looking for a master-planned community? Travisso’s got you covered. We offer state-of-the-art floor plans from award-winning premier builders. Homebuyers can choose homes ranging in size from 1,900 to over 5,000 square feet with prices starting in the 300s. And, there’s much more including resort style amenities, over 10 miles of proposed walking and biking trails, and a future 58 acre on-site regional park perfect for your active lifestyle. Visit us in Leander today and explore our new model homes and neighborhoods. For additional information call us at 512-243-8583.